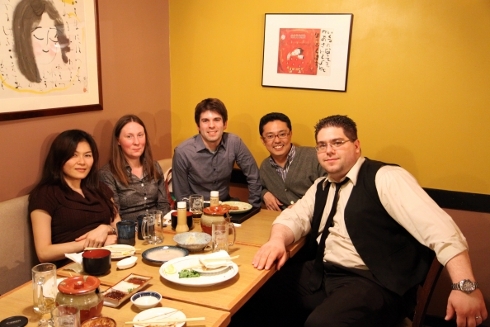 I recently met up with four other alumni from the Hitotsubashi University Graduate School of International Corporate Strategy (ICS for short), where I attended classes as an exchange student for a few months in 2008. This was the first time a group of us had organized a get together in New York and, to the best of my knowledge, the first meeting in the US. The program is just over 10 years old and, at around 180 students, is relatively compact and intimate. As such, there aren’t too many of us out there in the world (yet), particularly outside Asia. We make up for it as best we can with frequent virtual communication, but it’s difficult to share a pitcher of beer over Facebook. We hadn’t realized there was a group of us close enough to meet until a handful of people, including me, simultaneously sent notes to the head of alumni engagement asking if there were any plans to organize events in the US and what we could do to help. Within 48 hours, we had contacted everyone in and around the city and set a date, time and place to meet. Problem solved. None of us at this gathering had actually met before, but you wouldn’t have been able to tell a few moments after everyone was properly situated with vittles and frosty libations. It brought back one of my first memories from meeting my classmates in Tokyo years ago. I was told that one element they felt made ICS special was the emphasis on ba (場). Ba has a literal definition as a physical space, location or occasion. It also has the more abstract connotation of people coming together and meeting at an intellectual level in the shared experience of relationship building, idea shaping and creation of knowledge. Ba can also be a blend of both the tangible and intangible concepts. Ba is a little complicated. I think my friend Karen had the best shorthand explanation for getting the concept into one’s head: “You can go to the bar to have ba.” (In Karen’s Australian accent, the elongated vowels and dropped r make the two almost indistinguishable.) Worked for me. While in Tokyo I experienced classroom ba, cafeteria ba, conveyor belt sushi ba, wandering around ba, drinking ba and many other variations on a theme. The other night, we found ourselves at Katsuhama, an izakaya that specializes in tonkatsu: tender, juicy, breaded and deep fried pork cutlet. I’ll pause a moment to let the mental image linger. Ba doesn’t necessarily require food and drink, though they certainly do not hurt. This got me thinking about what other places make good platforms for ba. Cities are full of them. There are the obvious ones, like coffee shops and pubs. Squares and parks can certainly have ba. I think one can even find ba in buses, trains and their associated infrastructure. In urban planning parlance, the term third place, while not a direct equivalent, gets at many of the same issues. Third places (the first being one’s home, workplace the second) are social environments that are seen as hosts for community interaction and engagement, and are a key element of what gives a neighborhood its identity. Organizations like Project for Public Spaces make it their mission to understand how this works and how to create more of it. Dense urban communities and transit oriented development have the direct environmental benefit of reducing the need for car travel. They also lay down the latticework that supports, nurtures and binds together a network of first, second and third places. While environmental impact is not something at the top of every agenda, creation of a ba infused neighborhood that you can care about is an aspiration I think almost everyone can get behind. Kanpai! Michael – this is such a cool experience. Thanks so much for sharing it with us online. I love the concept of the “ba” – I can’t wait to see how this becomes a part of your career plan!